The WWE is in full holiday mode and RAW was no exception on Monday night. WWE Hall of Famer Hulk Hogan kicked off the festivities making a memorable Ho-Ho-Hogan appearance. It was certainly corny but it was also a lot of fun. 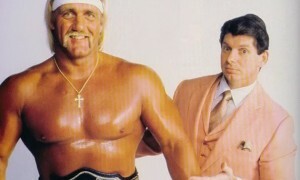 Hogan played the role of G.M. on Monday night and was in a giving mood. Hogan made matches and as you can see by this video he made a John Cena vs. Seth Rollins rematch which kicked off of the show. Hogan wasn’t the only legend to appear on the holiday edition of RAW. Rowdy Roddy Piper also made an appearance and brought back Piper’s Pit. I loved Piper’s Pit as a kid but the Pits aren’t nearly what they used to be, but it was still nice to see two of the biggest icons of my childhood back on WWE television. Hogan is itching to do more including wrestle. There are still plenty of rumors that a Hogan match is under consideration at WrestleMania. He would have to pass several physical tests in order to get clearance but if he gets clearance I say why not. The fans still love him and for one night only, I say you give the guy his swan song. In the meantime, we’ll have to settle for Santa with Muscles.